Why Purchase Hatch Through Us? 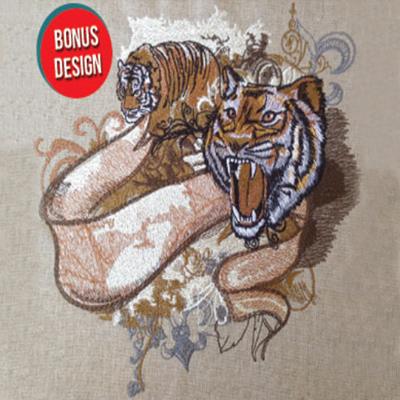 Hatch is an easy-to-use machine embroidery & digitizing software program that will quickly transform your creative ideas into reality with professional results. Hatch features world-class lettering, premium manual or auto-digitizing, monogramming, appliqué and sew much more in one incredibly powerful & affordable package. Download the free trial now & see how it stacks up to your current software program through comparison. Featuring industry-leading technology & Wilcom’s world-famous stitch quality, Hatch can be purchased all in one or in chunks allowing you to start off small & add on modules when it’s right for you. This makes Hatch perfect for embroiderers from all walks of life. Whether you’re a beginner, hobbyist or long-time embroidery enthusiast, Hatch is the perfect tool to help you take your embroidery to the next level today. I’m sure you’ve asked yourself: what is the best embroidery or digitizing software program for me? You’re not alone. Over the years I’ve had well over 100,000 people ask me this very question. I’ve personally been a loyal Wilcom user for over 25 years & am extremely happy that they’ve finally released Hatch as a professional alternative for the home embroiderer. Wilcom has been the gold-standard in commercial digitizing for over two decades now. Through Hatch, Wilcom has made commercial industry standards available to you, the home embroiderer. Now I’m not saying that Hatch is the end-all be-all of embroidery software programs, but I will list a few key features that set it apart. Properly pathing your designs before digitizing them is a must. Why not cut your learning curve in half & let Hatch do it perfectly for you? Unlike other embroidery font types, ESA Flexi-Fonts are 100% customizable. Re-size them, adjust stitch types, and change any node with just the click of a button! Not sure how to change the stitch count, density, underlay, push & pull compensation of your designs for different fabric types? No problem. Hatch’s native EMB file format has you covered. Enjoy 30 days of unlimited use of all the features! The beautiful tiger design displayed here. Two free guided tutorials: “Welcome to Hatch” ($19.95) & “ESA Lettering and Monograms” ($4.95). Two free Hatch lessons “Auto-Digitizing” ($19.95) & “Manual Digitizing” ($19.95), which both include fun projects. Hatch is so easy to use. Then add on top all the support from other users and Digitizing Made Easy’s video lessons the possibilities of creativity are endless... Once you go Hatch, your embroidery will never be the same! I encourage you to be a risk taker and go for it! Hatch is simply the best value on the market in a package that is easy to learn… Without Hatch I would no only be purchasing lots of designs of dubious quality, but I would not be able to make all those personalised gifts for my friends and family. I love the Hatch software. It’s extremely powerful and very easy to use… I wish I was personally as fast as my software… Digitizing Made Easy has tons of individual videos to help with many questions. They are really well done & easy to follow. I have had so many different digitizing programs since I started using an embroidery machine… I have been amazed by the Hatch software… You have the chance to go as far as you want to learn the program and classes and support are at your finger tips! You can relax in knowing that Hatch is covered by our full 30-Day Money Back Guarantee, which means you can have the confidence in knowing that if it doesn’t provide you with everything you need to take your embroidery to the next level… we’ll gladly refund your money – that’s how confident we are that this will be the best investment you ever make in your embroidery. I’ve always said: Any software program is only as good as the education & support that comes with it. 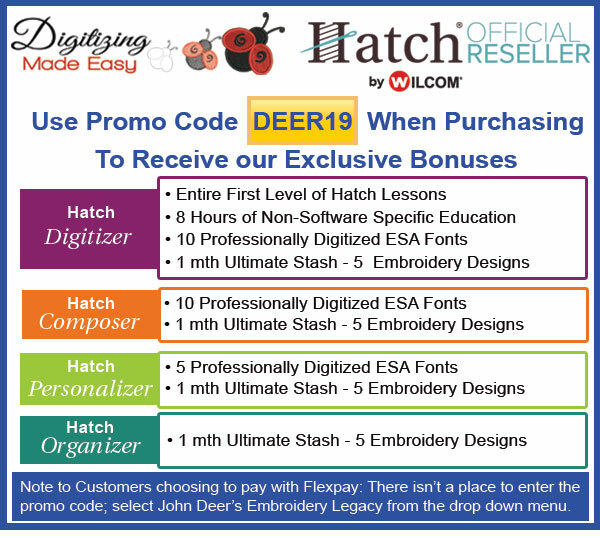 As an official Hatch re-seller, when you purchase Hatch through us we provide you with every tool necessary to turn your embroidery dreams into a reality quickly & easily. Who Is John Deer & What Does He Know About Embroidery Digitizing Software? John Deer has been the most awarded embroidery digitizer in the world for over two decades now. As a 4th generation embroiderer, John has an extremely unique history in the embroidery digitizing industry as he is one of the last two remaining Schiffli Masters active in North America. John learned and apprenticed under Swiss Schiffli Master Digitizers (then known as “punchers”) over 30 years ago in his grandparent’s factory, before computers even entered the digitizing world. In the 1990’s-2000s John owned & ran one of North America’s largest commercial digitizing house, where he did the digitizing for many large corporations including: Disney, Coco-Cola, GM, the NFL, & the NBA (to list a few amongst thousands). 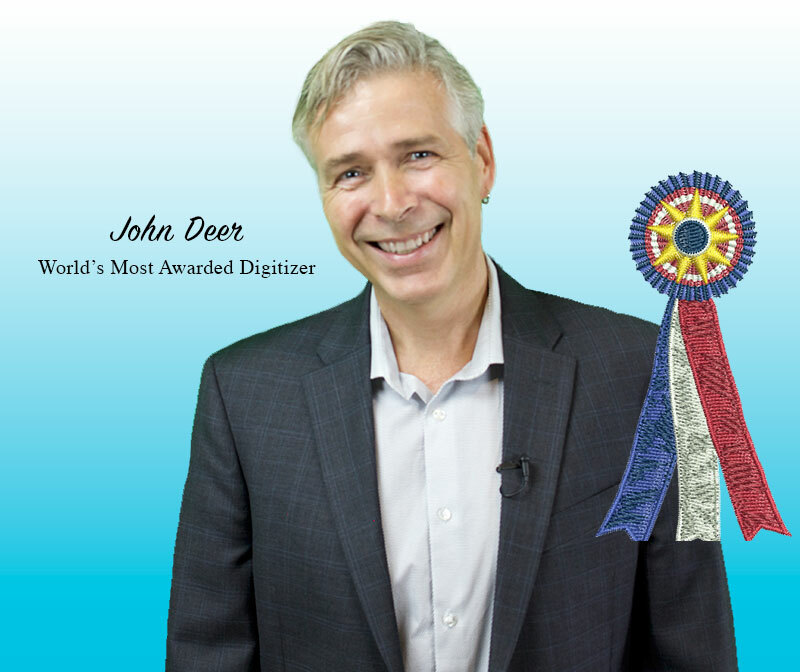 John has personally won 30 separate digitizing awards in the commercial industry and wrote the book on digitizing called “Digitizing Made Easy” which has sold over 40,000 copies & is used in Universities across the United States to teach those studying textile. John has produced hundreds of instructional and educational videos, which apply to embroidery enthusiasts of all levels. He has given hundreds of workshops and seminars all over the world & taught well over 100,000 people. Given John’s unique old-school training, family history, and vast embroidery knowledge, he is truly a master embroiderer & digitizer. Take Your Embroidery to the Next Level & Download Your Free 30 Day Hatch Trial with Unlimited Use of All the Features Today! Your Hatch trial is 100% risk-free with no credit card required.